Posted by fofo in Sql Server, Sql Server 2005, SQL Server 2008. In this post I would like to explain with some hands-on examples how to create a partitioned table in SQL Server and then manage the partitions. I know there are samples of how to do that in BOL,MSDN and elsewhere but I thought that it would be a good idea to give it a try with hands-on examples. Many people have found useful my style of posting. They feel they can follow the steps and master the technology/topic. We all know that at some point our database is going to grow and possibly become huge. In a database that it is e.g 3 Terabytes in size, we could have tables with million of rows. When we execute queries against tables with million of rows then we will probably get slow response times.We could partition the tables which means dividing the rows in various partitions based on column values.When you execute queries against tables that are partitioned may be much faster because SQL Server is able to search through a single partition to find the records needed instead of the entire table. 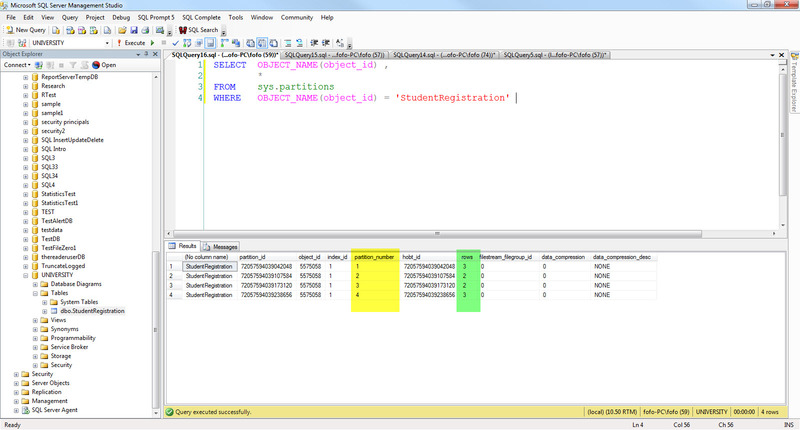 If you want to create a partitioned table you must. 1) Firstly, we have to select the table that must be partitioned. 2) Then we need to select the column on which the partition will take place. 3) Then we need to create a partition function. This is a function that specifies how to partition the table by defining partition key boundaries for each subset of data. 4) Then we need to create as partition scheme.It maps individual partitions to filegroups. Let’s move on to the hands-on examples. We need an instance of SQL Server running in our machine. I have SQL Server 2008 R2 Developer edition installed in my machine. In case you do not have an instance of Enterprise edition or Developer edition of SQL Server 2008 / R2, you can download it from here . This is a trial version. We need a database as well. I will create a brand new database later on. 1) Launch SQL Server Management studio and connect to the desired instance of the SQL Server.We will create a new database and then we will create 4 filegroups that will map to 4 physical files. 2) I will create a table that has information regarding student registration.I will create a column in that table that is called “RegistrationDate”.This will be the partition column.Note that I have not created the table yet. This is a good column for the partition because we can partition on different date ranges e.g put the registration dates for the past year in one partition and the registration dates for the period 2009 in another. I need one partition per filegroup at a minimum. 6 )Now let’s insert some data into the table.I will insert only 10 records but as I said in the beginning we apply partitioning on tables that have millions of rows. 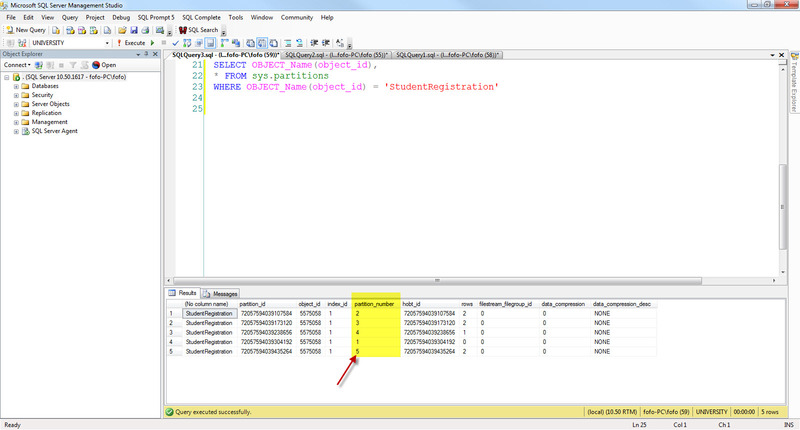 7) We can see the newly created partitions and the rows in each of them by executing the T-SQL statement below. 8) Νο Ι am going to demonstrate how to manage partitions.I am going to show you how to archive a partition into a separate table and then split an existing partition in two. Let’s assume that we want to archive the records from the first partition (rows with registration date earlier than 1-1-2008) into a separate table. I create the table-history/archive table. 9) Moving on let’s demonstrate how to split an existing partition to two partitions. I want to change my last partition that holds records from 1-1-2010 onward to two partitions that have records from 1-1-2010 to 1-1-2011 and another one from 1-1-2011 to present. I create a new filegroup.Then I add a file to the newly created filegroup.Then I change the partition scheme and finally split the records into the new partition using the SPLIT operator. 10) Now I want to merge the records from the partition with values from 1-1-2008 to 1-1-2009 with the partition with values from 1-1-2009 to 1-1-2010. I use the MERGE operator to achieve that by altering the partitioning function.When I execute the last statement I see that I have 4 partitions now. This article is so simple but very much effective. I read few articles for Partitioning but this one is so straightforward and easy to understand, Great job.